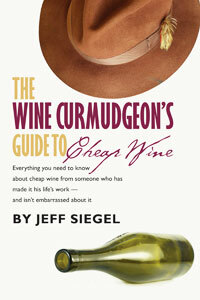 If you’re serious about wine, then Jeff Siegel’s volume on inexpensive value wine isn’t the only book you need to read. But you might be better off if it’s the first one you read, and the wine-consuming world might be a better place if everyone did the same. Why? Because Mr. Siegel, known to fans of his blog as “The Wine Curmudgeon,” dispenses with the “wine-speak” blather that is meant to intimidate consumers and offers instead the radical notion that it’s okay to like wine that doesn’t cost a lot. Not that there’s anything wrong with an expensive Bordeaux – depending upon the bottle, there will probably be a great deal to like about it – but it’s important for novices to recognize that “Cheap Wine” can be good wine. In fact, winemaking and viticulture techniques have improved to the point that the least expensive bottle of wine on the shelves at Costco or Trader Joe’s will likely be at least drinkable, if not actually enjoyable. And with a little care, you can pick wine that is both inexpensive and good. What I like most about Mr. Siegel’s approach is that he makes wine approachable for folks that might otherwise stick with beer or vodka. Wine can be intimidating for the newcomer, and too many wine writers, sommeliers, and even the staff in tasting rooms seem to delight in making in making wine something of a black art that only the initiated can understand. As I write this, I’m sipping a $14 bottle of 2009 Barolo that I bought at Trader Joe’s. As it happens, I had purchased this wine a few months ago and discovered last week when I opened it that it was “corked,” which is to say, inflicted with that wet-dog smell that comes from TCA taint. I returned it to TJs, and without asking a question, they replaced the bottle. So here’s a little side note: trust yourself, and don’t be afraid to return a bottle that you think is corked or which otherwise suffers from a real wine flaw. Chances are, the guy behind the counter knows less than you do about wine. The replacement bottle was wonderful, and that brings me back to the real point of this story, which is that wine need not be expensive to be good. Sometimes, in fact, cheaper is better — for reasons that go beyond the obvious. As it happens, I have a small collection of Barolos in my Eurocave wine cabinet, including three bottles from the 2000 vintage that we brought back from the little Barolo-producing village of La Morra on a trip to Italy. I am sure they are all exquisite wines. Actually, since I have tasted at least one bottle from each vintage and winery, I can say with some confidence that they are all exquisite, assuming they have aged well. But the $14 bottle of TJ’s Barolo is a real joy, and at that price, I don’t have to hold my breath when I open one. I don’t have the world’s best palate, but I get ripe red cherry, nicely muted tannins, and perhaps some strawberry or plum. No cedar, no sandalwood, no hints of Cuban tobacco or any of the other obscure flavors or aromas that “winestream media” critics, to use Mr. Siegel’s term, would employ to describe a Barolo. Just a lovely wine that bursts with fruit. Cheap Wine doesn’t provide a list of inexpensive wines to buy, but as Mr. Siegel notes, you can always check out his blog and his annual “$10 Hall of Fame,” which lists the best of his cheap wine finds. What the book does do, is introduce the reader to the basics of how to sniff out a good value wine. Part of the process is nothing more complicated than “buy and drink” and remember what you like. Mr. Siegel goes further, offering advice on how to tell a good wine retailer from a bad one and deflating the idea that certain wines go only with certain foods. Drink what you like, for God’s sake! So he introduces methodology, rather than specific brands, particularly in his “Advanced Course” chapter. For example, he presents the value/price tradeoff, contending that wines in the $12 and under category provide more value than any other category, while the $12 to $18 category, being the province of Big Wine, provides little value overall. That doesn’t mean the higher-priced wines aren’t good, just that the quality of the wine doesn’t increase as much as the price as you move into that segment. From $18 to $30, though, you can find value, especially from old world wines (think, Europe). Above that? Well, that depends upon what you’re looking for. Higher priced wines may be wonderful, they don’t provide as much value, at least in monetary terms. Instead, he notes, determining value in a $100 bottle of wine is more of a metaphysical question. I think that is a reasonable perspective. Can I really say that a $100 St. Emilion is 10 times better than a $10 Bogle Merlot? Probably not. But my personal view is that everyone who loves wine should occasionally splurge on an expensive bottle and experience the joy of a complex wine that will evolve in your glass over the course of the evening. In between those moments, though, there’s no reason not to enjoy a cheap wine, which is to say, a value wine – a Rioja from Spain, a Cabernet from Chile, or a Merlot from Paso Robles, for example – that can be had for $12 or less. You may not find hints of Cuban tobacco or Sandalwood in the wine, but you may fall in love with it nevertheless.